I had good intentions. The BEST intentions actually! 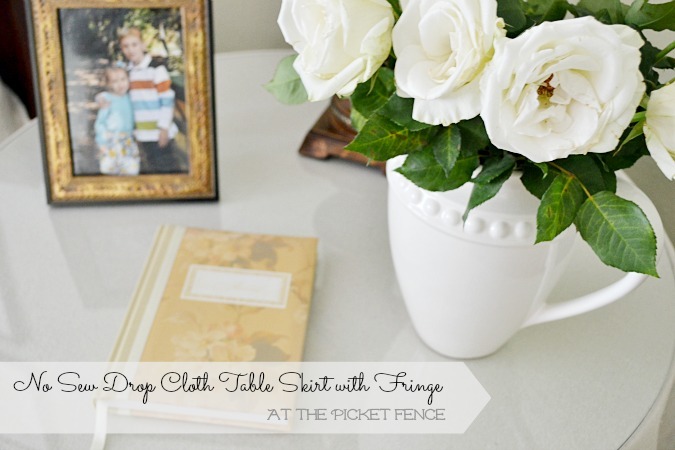 I was going to share with you a tutorial on how to make a no-sew drop cloth table skirt. 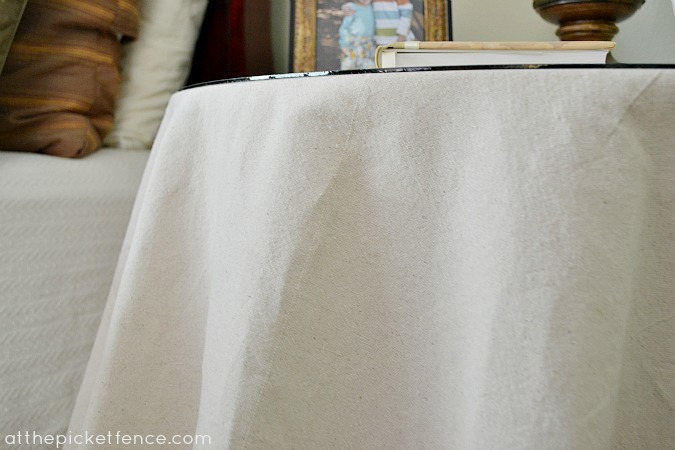 I was going to show you how easy it is to make a round tablecloth. Because I have actually made one before. And I even sewed it instead of using liquid stitch! I was going to do sketches and mathematical equations and throw around words like “diameter” and “circumference” and wow you with my sewing knowledge. Then I went and took the easy way out. I bought the largest drop cloth I could find and laundered it to get that soft linen-y feel. After laying it on the floor I realized just how big it was. And this led to me wondering if I could just cut a giant circle out of the middle. I used another round tablecloth as my guide and just cut that big ol’ circle right out! It all happened so fast and I was so excited about the simplicity of this project until I remembered that I was really looking forward to showing you all how to make a no-sew table skirt the proper way. I stood there in my foyer (which is the only place big enough for the largest sized drop cloth to be spread out) and I hung my head in shame. Then I remembered that I still had to add the fringe. Oh, that glorious bullion fringe that I got for 40% off! I quickly got out the Liquid Stitch and “stitched” it right on. And suddenly that simple drop cloth circle took on a more luxurious feel. 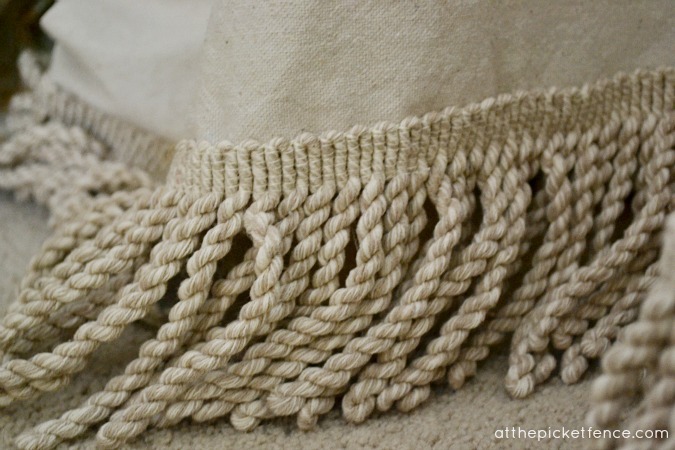 I realized that, in reality, I actually HAD made a No-Sew Drop Cloth Table Skirt with Bullion Fringe just as I had set out to do in the very beginning. And maybe, just maybe, I have in fact spared all of you from those dreadful words like “diameter” and “circumference“. 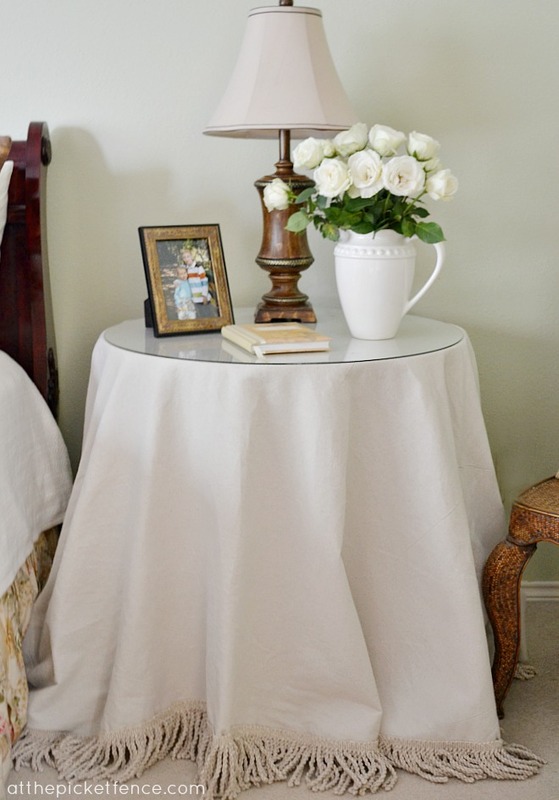 Because now you know that you can simply cut out a circle from a large drop cloth to make a table skirt. Or you can just Google, “how to make a round tablecloth” and get the full tutorial from someone else. Someone who will give you step-by-step instructions. Someone who will probably include sketches. Someone who would probably NEVER just cut out a giant circle from a drop cloth and call it good. As for me, I’ll just be here, holding my head up high now that my coveting of the beautiful Ballard Designs table skirt with bullion fringe has had such a happy ending after all! 56 Comments on "I Owe You an Apology…"
This is so pretty! I wish I had a round table to cover! I love this. 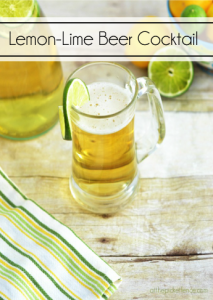 I’ll have to add this to my list of things I want to make this summer. It is gorgeous. Where did you find the trim? I love it, Vanessa! It doesn’t get much easier than this! : ) This would be perfect in my master bedroom to cover our two Bombay side tables. Sometimes I’d like a different look and this would give me that without having to paint them or break the budget. I just need to get the glass for the top. I’m so totally impressed and you didn’t even you those dreaded words! I have to do this, I love the look. It would be perfect for me because I’m no seamstress! I’ll have to go look for that drop cloth and fringe. Great post Ann. 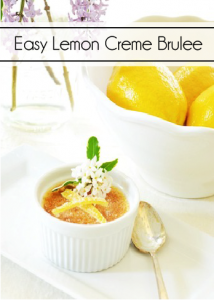 Love this project even without the step by step tutorial with glossy black and whites. And DUH…why didn’t I ever think of just using a round tablecloth that I have in my stash for the pattern. Its been a long winter, I guess my brain is just frozen for the moment. Thanks so much for sharing. A no sew project is the best kind! The table skirt looks awesome with that fringe! I’ve gotta buy some of that liquid stitch! LOVE it! 🙂 Great “tutorial,” too! Simple is ALWAYS better. This is so my kind of DIY project…happy to see that I have company in this area:) The tablecloth looks great my friend. Sometimes a 5 word instruction is better than a 15 page tutorial 😉 I absolutely love it! I may have to go work on my circle cutting skills now for my little round table 🙂 Thanks! haha! No shame in a 2 step easy no sew DIY. Pictures not necessary…except for that luxurious ‘DONE’! It’s gorgeous, Vanessa! I LOVE this idea! And it is SO pretty!!! What size is the table you covered? I am going to do this! AND I am going to Pin this!! Thanks for sharing. simple and great looking. i’m going to try this idea for some curtains! I am soooooo excited!! I have a round table that I need to recover and this would go perfectly with my bargain sofa that I just had slip covers made from DROP CLOTHS!! One of those things that makes me go “Now why didn’t I think of that!” And since I don’t sew this is the perfect project for me!! I am glad you forgot all that other stuff, ’cause to be quite honest, you would have lost me. thank you, thank you, thank you!! 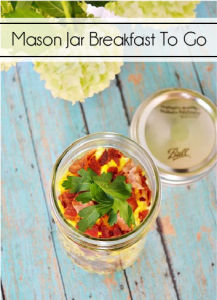 Love it – excellent DYI copycat – looks awesome. Why reinvent the wheel? Oh wait, nm that has diameter and circumference lol. Oh Vanessa…no need for shame here…your table skirt is just beautiful!!! I am funny in the way that I’d rather be given quick “this is what i did”, than an involved step by step tutorial for a project like this one. The more simplistic and easy the better…and if you can pull off results like your table skirt then I say kudos to you!!! Oh Simple is BEST! and it looks fantastic! 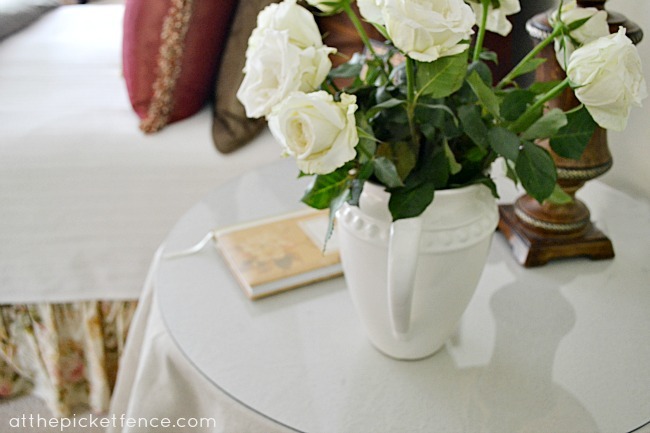 I love “the easy peasy” projects…the table skirt is gorgeous!!! I love your easier version. It looks awesome with the fringe…very Ballard Design-like. Now that’s a tablecloth project I can do! It looks great! Thanks so much for sharing. I love this project and the fringe on the bottom of the skirt is fantastic! This is fabulous! I thought about just cutting a circle in my drop cloth (my dining table is round) but I never thought to use another round tablecloth as a template. Whoo Hoo! Thanks for the “tutorial”!! Wow! Make me one! Haha. Ok, don’t want to? Then tell me where you bought the drop cloth because I am just that lazy! This is right up my alley, Vanessa! Thanks for sharing! No way you should be hanging your head in shame! The tablecloth turned out beautifully. You’d never ever know that you took the “easy” way out. I’m always so much more impressed when someone figures out an easy way to do something so wonderful. No matter, your round table cloth is beautiful. You go girl! Who needs circumference when you have liquid stitch! Awesome project! I happen to like your way better than the one with words like circumference and diameter. What a beautiful idea! I love drop cloth! And I am a big fan of liquid stitch. 🙂 Thank you for the inspiration, Vanessa! Vanessa, it’s beautiful! The fringe makes this table skirt so chic! So glad for your discovery! I have an extra large round dining room table and have to make my own tablecloths usually and this is the simplest way to do it! Looks great and the bouillon fringe adds a LOT. So perfect, and no shame whatsoever! Thanks for the inspiration! What a great idea! I am so doing this in our guest bedroom! I have a skirted table with an out of date skirt from the 90s!!! Going to use it as the pattern. On this weekend’s to do list! Math hurts my head — so thank you so much for just cutting that big ol’ circle out of a big ol’ drop cloth! The fringe addition is perfection! Seems very smart to me! I especially like the bouillon trim, Vanessa. Glad you had the room to lay it out. I’d have to do it in the garage. Oh wait- that place has less room than my great room. Can you say hoarder?